Who Cares About China's Stealth Fighter or Aircraft Carriers. This Is the Plane America Needs to Fear. As China rises to the status of a global superpower, it is looking to acquire assets on a scale possessed previously only found operated by the United States: a huge fleet of gigantic, globe-spanning cargo planes. In some ways, the Y-20 and its possible successors may prove more important to projecting China’s military and political might than attention-grabbing new stealth fighters and aircraft carriers. The latter systems only perform at full potential when combatting hi-tech enemies in a high-intensity conflict—or deterring one. As China rises to the status of a global superpower, it is looking to acquire assets on a scale possessed previously only found operated by the United States: a huge fleet of gigantic, globe-spanning cargo planes. Indeed, its new Y-20 “Chubby Girl” transport is the largest aircraft in production since the U.S. completed production of the C-17. The U.S. Air Force currently operates nearly six hundred C-130 Hercules, C-17 Globemaster and C-5 Galaxy cargo planes. The People’s Liberation Army Air Force only as around 145 transports according to figures from Flight Global, of which 43 are Y-7s only capable of lifting six tons. For global ‘strategic’ lift capability, the PLAAF relies on twenty-two Il-76MD jets purchased from Russia which can lug 53 tons of cargo in their portly holds. For example, after the outbreak of civil war in Libya in 2011, the PLAAF mustered four Il-76s to evacuate its citizens. Today, China increasingly needs to sustain military deployments to Africa as well as bases and allies in the Indian and Pacific Ocean. But the desire for strategic airlift capability can also be explained by factors much closer to home. After the devastating 2005 earthquake in Sichuan, the PLAAF struggled to deploy cargo planes to the disaster zone. Just a year later, the Xi’an Aircraft Corporation began work on a new strategic airlifter. Previously, nearly all Chinese transports were clones or imports of Soviet designs, and Xi’an indeed turned to the Antonov design bureau for assistance. The Ukrainian company offered a scaled-up, jet-powered derivative of its An-70 turbobrop transport. The design had to be further revised, however, as China developed a heavier 64-ton Type 99A main battle-tank. Development was eventually handed off to Tang Changhong, the designer of the JH-7 fighter-bomber. Under his leadership, the development team adopted design techniques first implemented on the Boeing 787 jetliner and Airbus A400, insisting that the new cargo jet be entirely designed using 3D-modeling (or Model-Based Definition), and use 3D-printed composite materials. He also used relational-design technology, in which the ‘skeleton’ of the plane is modeled, so that if one aspect of the geometry is modified, the other parts are automatically adjusted. This approach reportedly cut stages of the aircraft’s development and assembly time by 30 to 75 percent, resulting in a flying prototype by January 2013. The four-engine aircraft’s broad fuselage give it a distant resemblance to the larger C-17 and led to its popular appellation Pàng niū (“Chubby Girl”) rather than its official title of Kunpeng, a mythical far-flying bird. Heavy tires on the 110-ton jet’s low-hanging belly allow it to land on rough, unpaved airstrips close to the frontline, and it reportedly can take off from a strip as short as six hundred to seven hundred meters long. However, the Y-20 would also have long reach, able to fly 2,700 miles with maxed-out payload, or 4,500 to 6,200 miles carrying medium or light loads, traveling at a maximum speed of 575 miles per hour. In theory, the Y-20’s capacious four-meter tall hold can lift up to 72.5 tons, making it superior to the Il-76, but still behind the C-17’s 85.5-ton maximum payload. Still, that’s enough capacity to carry a Type 99 tank, or multiple lighter armored vehicles—including at least three parachutable ZBD-03 airborne fighting vehicles. However, there’s a catch—and as with most Chinese jet aircraft, that catch has to do with domestically-built turbofans. The Y-20s are currently powered by Russian Soloviev D-30 turbofans also used on the Il-7j--j6 and the H-6 strategic bomber, limiting lift capacity to around fifty-five tons. However, top performance figures assume the use more powerful domestic Shenyang WS-20 high-bypass turbofans with thrust increased from twenty-four thousand to twenty-eight thousand pounds. However, the WS-20 is a high-bypass derivative of the WS-10A Taihang engine used on the J-11 jet fighter—which has suffered infamous performance and reliability shortfalls. That it may take a while for the WS-20 to be ready is hinted at by the reported introduction on the Y-20 of an interim turbofan, the WS-18, reverse-engineered from the D-30 and modestly enhanced with more thrust and lower fuel consumption. 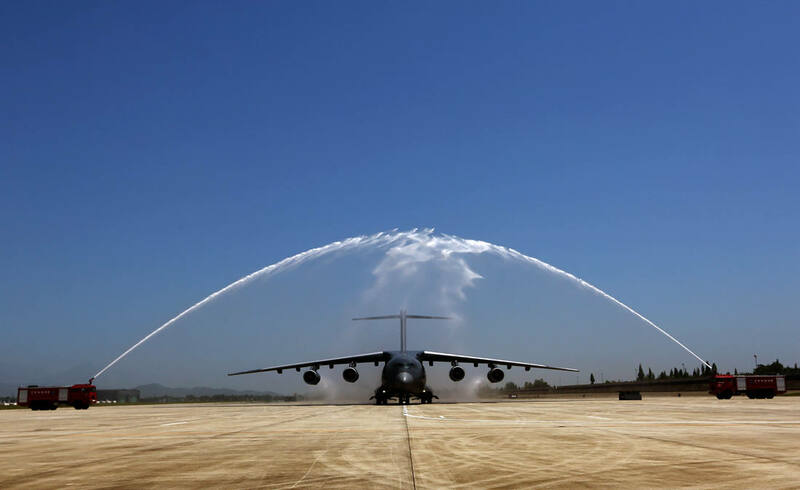 Besides strategic airlift, it is nearly certain that China will deploy Y-20 variants to serve as aerial tankers and airborne early warning AWACS planes. The former could especially prove a potent force multiplier, as a Y-20 tanker’s range and payload capacity could sustain China’s air-refueling capable H-6K strategic bombers to deliver strikes across the Pacific Ocean. The Y-20’s long range may also make it ideal as an maritime patrol plane with anti-submarine capabilities, or an electronic warfare or spy plane—though it may actually be larger than necessary for some of these roles. One shortcoming, however, is that the Y-20 does not yet appear capable of receiving aerial-refueling for now. Beijing has also talked up using Y-20s to rapidly deploy satellites into space using solid-fuel rockets, which would have many civilian and military application. Some also speculate it would make a sensible test platform for an airborne laser to shoot down ballistic missiles. Xi’an also intends to build a civilian freighter version, and is seeking to export the Y-20 abroad. Sri Lanka has already expressed interest in acquiring some to serve in a military-run airline. Just how many Y-20s the PLAAF has ordered remains a mystery—at least eight are known to have entered service by 2018. The Y-20’s cost also remains obscure, with numbers ranging from $160 to $250 million floated. In 2016, AVIC official Zhu Qian raised eyebrows by claiming that China would need at least one thousand Y-20s—more than the number of heavy cargo jets in service around the world! Of course, Zhu spoke on behalf of the manufacturer, not the Chinese military. An earlier published study by the National Defense University posited a still staggering requirement for four hundred Y-20s. However, Chinese defense analyst Xu Yongling told People’s Daily that Beijing might not order more than a hundred Y-20s, claiming that a more advanced third-generation transport design was likely to follow in five to ten years. Qian’s statement also revealed an intent to build even larger transports comparable to the United States’ C-5 Galaxy—or Antonov An-225, the largest operational plane on the planet (max payload of around 275 tons!) one of which China has purchased from Ukraine. In some ways, the Y-20 and its possible successors may prove more important to projecting China’s military and political might than attention-grabbing new stealth fighters and aircraft carriers. The latter systems only perform at full potential when combatting hi-tech enemies in a high-intensity conflict—or deterring one. But a large fleet of cargo planes offers a capability more routinely applicable to China’s rise as a superpower—the ability to rapidly deploy, and sustain military forces or humanitarian missions across the globe. That has implications for “hard” military power confrontation, but also China’s capacity to participate in the sort of “global governance” missions abroad formerly performed in large part by the United States and Europe. China's J-20 Stealth Fighter vs. America's F-35, Taiwan's F-16 and Japan's F-15: Who Wins?